As an online investor, you might be interested in finding out how many investors are shorting a stock you own, a statistic known as short interest. Some investors even incorporate tracking short interest in their strategies by seeking stocks that are heavily shorted, on the theory if the shorts are wrong the stock might surge higher in a short squeeze. Point your browser to NASDAQ. Enter the stock’s symbol in the blank space beneath the Get Stock Quotes heading. Click the blue Info Quotes button underneath the blank. 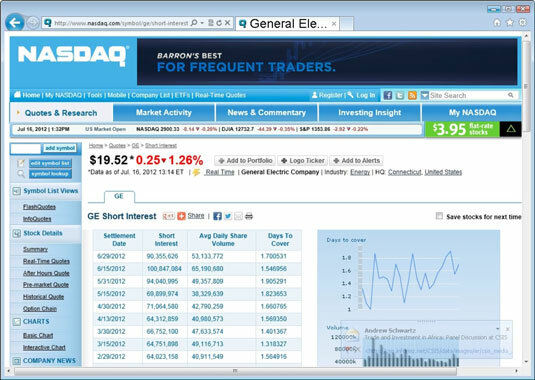 Choose Short Interest from the drop-down menu in the middle of the screen. You see a detailed list that shows you the number of shares being shorted. That number in itself doesn’t tell you much because different companies have different numbers of shares trading, or shares outstanding. So, to put the level of short interest in perspective, you also get to see the average daily share volume. Lastly, you see days to cover, which is calculated by dividing the number of shares shorted by the average daily share volume. The bottom line? The higher the days to cover, the greater the amount of real short interest in the stock.